July's Newsletter brings you up to date with all at Punch with Judy, please enjoy. Between newsletters, my blog and editorials for Into Craft, I seem to be forever writing. Family visited last month to help celebrate our 50th Golden Wedding Anniversary, reported on my Blog, plus we've had our share of visitors already this year. Farm is looking healthy as we've had small, regular downfalls of rain. Enjoyed lunch in Wagga today with eldest Grandson, Reece, who is in the Army at Kapooka, plus Sharelle, Andrew and Jasmine and some Army friends. All very nice. 2nd eldest Granddaughter, Courtney, turned 18 yesterday, so is now "of age". She is presently doing her HSC (12th year at school for overseas readers) so celebrations may be deferred. Lots of new products are added each month and it never ceases to amaze me how people keep coming up with such new innovative products. Sewing and Crafting are not dead by any means - they're on the up and up each year. Hope to catch up with you somewhere during the year at a show. Another BEST friend is a finalist this week in Retail Association's Small Business Awards and we wish her well - she's bound to win, but I'm biased. Her business is located well south of Sydney, giving support to those women with mastectomy needs. To all my quilting friends enjoying the weekend at the Scquilters Retreat, this year held at Bendigo Vic, wish I could be with you; enjoy yourselves, have fun! The Craft & Quilt Fair has it all - free workshops, hands-on classes, shopping and quilt displays - all under one roof. Please do come and visit Punch with Judy on Stand A11. Plus, we have a full day's program of 30 minute demonstrations on the Into Craft stand as Nifty Notions. Leonie & Bill West from Westalee Designs, will be my Guests demonstrating their award-winning inventions of the Westalee Quilting Ruler and Template Product Range. Lots of new ones such as the Kali Star, Illusions Tool and Spike n Peeper for Dresden Plate. All so very inspiring. Catch Leonie's workshop helping you become a better quilter, in Workshop 2 at 1.00pm daily. Hope you will find time to attend some or all of our demonstrations which we are proud to present for you. SEE YOU ALL AT THE SHOW and remember, if you would like any order brought to the show, please let me know before noon Monday 22nd July. Saves you postage on mail orders and saves you time at the Show. All special orders for collection at shows now need to be pre-paid to ensure they are collected. I'm sure you'll understand. Don't forget your Show Coupons too. Print them and collect your discounted products or receive your FREEBIES. No coupon, No Offer. 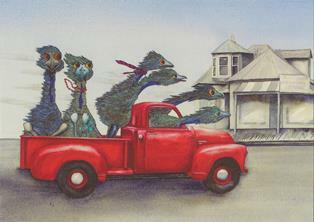 Following this show, we will travel to Canberra for the Craft & Quilt Fair from August 8 - 11, held at Exhibition Park in Canberra, Mitchell, ACT. Expertise Events proudly announced the relaunch of the Textile Art Festival which I reported to you in a previous Quick News. Full details of the Creative Textile Show will be available shortly including details of their challenges. To be held in Canberra at the National Convention Centre, right in the heart of Canberra, from 2 - 4 May 2014. Mark your diary, no matter which State you live in, or from NZ, BE THERE. 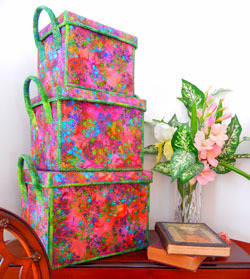 Machine Embroidery Retreat will be held from 21st - 23rd September, 2013. Bookings are very strong already, so if you've not confirmed and paid your deposit you should do so as soon as possible. There are only a few vacancies left so please confirm your place with a $100.00 deposit asap. Visit the Retreats section. We have students booked from as far away at south of Perth and approx. 5 mobile homes/caravans staying on our property for the duration of the Retreat. Should be an eventful time. Yes, the fellas come too! Several Online Classes are being held presently with students enjoying the classes offered. I couldn't be happier with projects they have been sharing on our Yahoo Group. The Westalee Mystery Sampler Quilt the Westalee Constellation Quilt Course, the Curve Master Course, Punchneedle Course and the Pleatmaker Course are indeed in full swing. Cut off time to join in any of these is 31st July, otherwise, there's always next year. Where do I start here? There are numerous new products added every month that you certainly will have your eyes opened if you haven't visited What's New? for some time. Don't forget to visit the Archives too because if you don't visit often you may have missed last month's new additions. 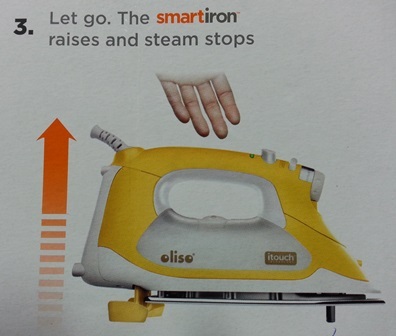 New products added only this week include the new Oliso Pro smartiron which lowers and raises itself by touch and has NO feet. You really must view the video to see how different it is from any other iron. Another new product that I'm very impressed with is The Perfect Ruler. It may have been designed for papercrafts, but it is excellent for general crafts and patchwork too. The secret? The patented Grip Strip holds your project in place with no slipping - and it DOES work. 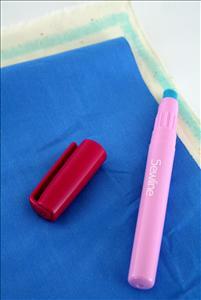 I've tried it and it sure does grip the plastic, paper, template or fabric and makes marking accurate. Lots of new patterns from my favourite Bag Pattern companies such as By Annie and StudioKat Designs. See them all in the What's New? section. There's also a great new applique pattern from Joan's Own Creations too featuring three outhouses, which we'd call "dunnies". You'll love them. Superior Threads have introduced several new products including a beautiful silk thread called Kimono Silk Thread, Magnifico and Fantastico - all of which will become firm favourites. I am sure those who were fortunate enough to attend Todd Purcell's lectures at both the AQC in Melbourne and the CQF in Sydney are wiser about the whole thread story and received their Diploma of Threadology! Todd is the son of Superior Threads founder Bob Purcell and we certainly were delighted to have him and his wife Marti on our stand. Exciting new products from Innovative Crafts for making boxes, bags, flowers and home decorating projects and new additions to the Sewline Range of products. I talk about all these products in my Nifty Notions presentations at the Craft & Quilt Fairs. 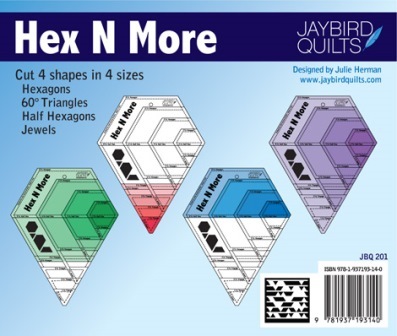 There has been some interesting new quilting rulers added such as the Kaleidoscope Smart-Plate Ruler, including a book full of pattern ideas and the Hex N More Ruler showing new ideas for the ever popular hexagon shape. I have some more fabulous exciting new products on their way too. The Kali Star from Westalee Design Rulers has been a runaway success and no wonder. Look at what you may achieve..... remember to watch our demonstrations at the shows. Kali Star quilt shown here was made by Leonie West. 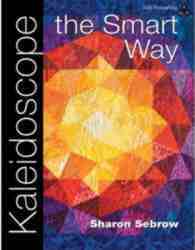 Leonie has had so many requests for "how did you do yours exactly" that she has now released a 71 page book, simply called "Kali Star". 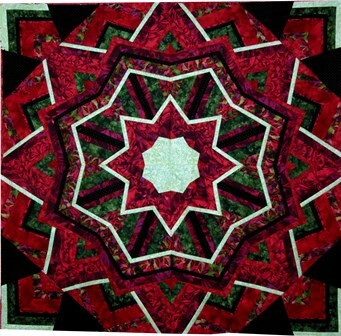 Leonie gives 88 Kaleidoscopic Quilt design ideas for 5 different sized square quilts in 9 chapters making and creating different Kali Star quilts. We have been asked at every show for more information and so has Leonie when she's been teaching. So, here you are! Thank you Leonie, who said "When I first designed the Kali Star Quilt, I fell in love with the 42.5" x 42.5" quilt and the way the quilt changed, depending upon the fabric choice. Then the choice of strip widths for the strip sets changed the look once more. 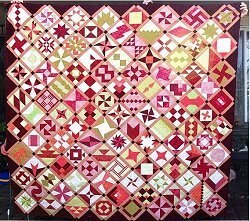 The more I played with the quilt, the more I discovered by adding setting triangles and setting blocks, the quilt not only changed, it grew. But the fun really started when I started to rotate the units of the quilt". I am sure you'll have fun too! Not really a product Made in Australia, but I am including it here because I think you will see the connection. Into Craft is inviting you to "TELL YOUR AUSTRALIAN STORY" to The Australian Women's Weekly, sponsor of the Craft & Quilt Fairs. As part of The Weekly's 80th birthday celebrations, they are conducting a search for Great Australian Stories and they'll have a special presentation at the Brisbane Craft & Quilt Fair, 16 - 20 October 2013 at the Brisbane Exhibition Centre, South Bank. The Weekly has launched a nationwide search to uncover the best stories in the land. So c'mon, here's your chance. Helen McCabe, The Weekly's Editor-in-Chief, explains that Australian women have played a central role in our history and they've decided to scour the country for Great Australian Stories. Women of the Australian crafting community who feel they have a story to tell, or know someone who has a compelling life story worth sharing, they'd like to hear from you. To see a sample of some uncovered already, visit here. In this section we have wonderful FREE Projects for you. 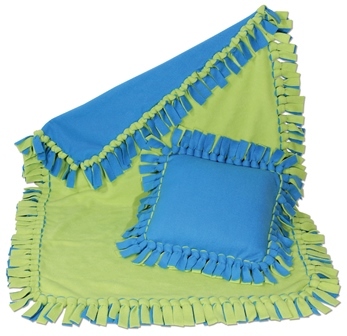 This month we've added some great easy projects using Polar Fleece, to keep you warm for the rest of the winter. With the kind permission of June Tailor Inc.
Watch for the next e-Newsletter from Into Craft as I will be talking about keeping warm with Polarfleece. My current editorial discusses some of my favourite products for removing stains. Do read it. Simply visit Damaged & Discontinued, order whichever you please, then type in the Additional Comments section of your order that you wish to purchase the one from the D&D for such and such a price as the normal retail price will be showing on your order. Don't worry about that, we'll adjust manually. Presently, I have two Block Butlers that have been opened and displayed, if you'd like either they are less 50%. Just mention it in the additional comments section when you order. I've recently added several new tutorials here. Many to do with products mentioned in the What's New? column. This is a great way for you to learn more about products and spend a few hours sipping a hot drink. 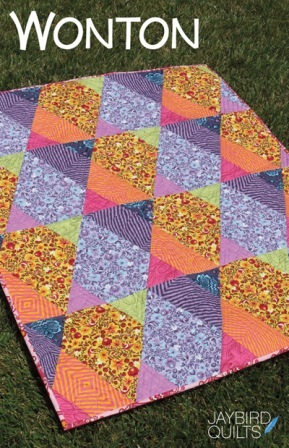 Have you seen the projects and finished quilts from students' work from Online Classes? Particularly the large quilts students have made from the Westalee Mystery Quilt Course. Do view them as I'm so very proud of all these students. There's a few more I should add asap too. Shown here is Therese Parry's Quilt, winner of the 2012 Westalee Mystery Quilt competition, one of our Online Students. Did you know that you do not have to use the same thread in type and size in the bobbin as you do for your top thread? Yes, I know, many of you already know this, but this was the most applauded statement made by Todd Purcell during his seminars on Thread Therapy at the two shows he lectured at earlier this year in Australia. We are hoping he is returning in the very near future. If you get a chance, don't miss one of his seminars - the 16 page note booklet given has a wealth of thread knowledge packed into it. Did you know that if you are having trouble threading your hand sewing needle, turn the needle around and thread from the other side of the needle through the eye? Why? Because the eye is "stamped" out and will have one side as a better entry because of eye's internal shape. Alternatively, try threading the other end of the thread. Why? Because of the twist in the thread, it won't unravel as easily. Did you know that you can make your own vehicle from recycled rubbish laying around the farm? 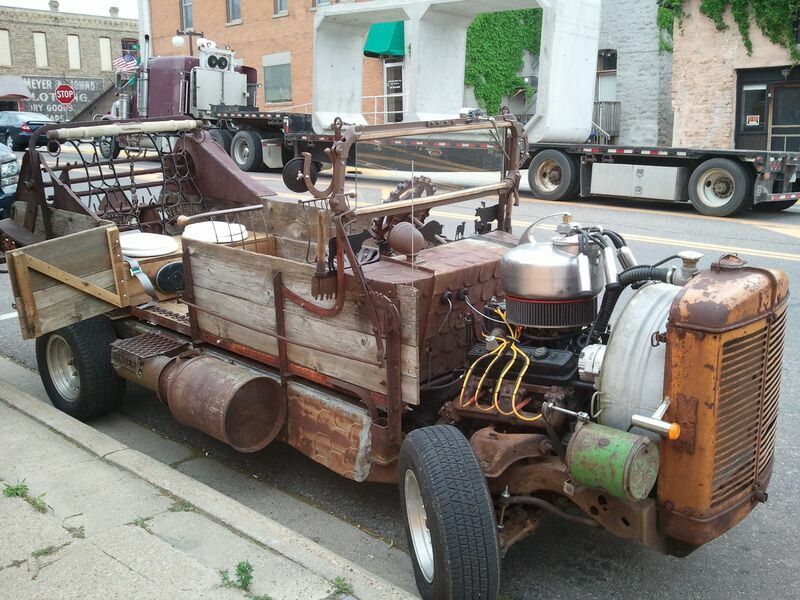 Look at John's new farm getaround. No, just kidding, but a farmer in the USA did just that! Ingenious but made from someone with a lot of time on his hands. A question I was asked this week from a regular customer who recently moved to Darwin where, as you know, has high humidity. Her question: "Judy, I have a question about the Sewline Fabric Glue Stick - it's very hot here in Darwin all year round and I was wondering if it may be a good idea to keep these in the fridge? What are your thoughts on this? Would it damage the glue?" Well, I didn't know, so I asked Charlotte from Sewline. She thought it better to ask the Japanese Company, just to be sure. Here is their reply: "The Glue itself is tested to 50â„ƒ condition for three months. If the cap was firmly sealed, it would not be necessary to keep the glue in fridge if it is the normal temperature. In other words, if the temperature goes up more than 50â„ƒã€it would be better to keep it in fridge. But the cap needs to be firmly sealed (cap on). If the cap is on loosely, the glue will be dried." So, the secret is to keep the cap tightly in place! By the way, they now have both pink or blue in the refills. Both colours dry clear. It is indeed a wonderful product. Have you tried it? Copyright Â© 2013 Punch with Judy, All rights reserved.